We use and highly recommend BigScoots for your WP Hosting because we LOVE them! Their tech support is awesome, make sure to check them out for great peace of mind! 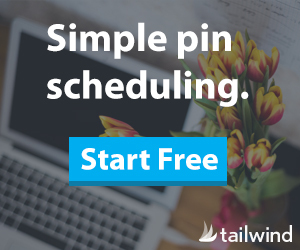 If you’re a blogger, you need Tailwind for easier Pinterest pinning, which will save you so much time too! This page contains affiliate links, which will add no extra cost to you. Thank you if you make a purchase – it will help support our blog. Please see our disclosure policy.